By popular demand, our weekly sparkly celebration concentrates on the trademark of one of everybody's favorite royals: Crown Princess Victoria and the Baden Fringe Tiara. Sometimes also called the Sunray Tiara (and variations of that), it originally belonged to Queen Victoria of Sweden. It was a wedding gift from her parents, the Grand Duke and Duchess of Baden, for her 1881 marriage to Crown Prince Gustaf of Sweden. The tiara is composed of 47 diamond rays. Like many of its fringe counterparts, it is a flexible piece that can be removed from the frame and worn as a necklace or other ornament. Or at least it was originally made that way; though Queen Victoria wore it as such, we only see it in tiara form these days. A bit surprising given the talent of the ladies of the Swedish house to do interesting things with their jewels. Queen Victoria left the tiara to a family foundation, which ensured that it would stay in the family. It has been worn by many family members over the years, but since Crown Princess Victoria started wearing it, it has mostly been left to her. This is right in line with Queen Victoria's wishes, as she wanted it to be a piece mainly for Crown Princesses. And appropriately, the Crown Princess has made it her signature piece. Fringe tiaras were a dime a dozen at one time; most royal and noble families have or have had one at some point in their history. This one is my favorite twist on the classic fringe form. The rays have a diamond shape to them, and they fan out to create a halo around the wearer's head. It also wraps further around the head and has a greater height difference between the tallest and shortest spikes than most fringes do. Tiaras that extend so far back are often harder to wear, so it's a good thing this one belongs to the Swedish royal family. They have the hairdressing prowess to make it work, and even have some fun with it in the process. We need to have an ode to Swedish tiara hair sometime because, man - nobody does it better. Are you a fan of this sunny fringe? 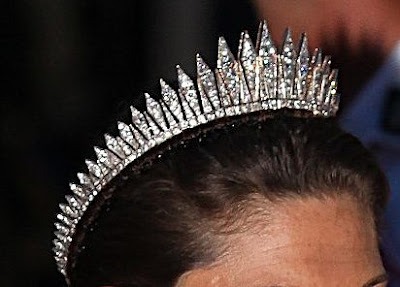 This tiara was voted #11 on your Top 15 Favorite Tiaras!